Note:Please install the unit face south and make sure the solar panel can get the sunlight directly without any shelter or glass. For optimum battery performance, please allow the batteries to charge for 2 or 3 sunny days before turning the lights on for the first time. The URPOWER outdoor LED solar light are charged directly from the sun, so you never need batteries or power cords,apart in minutes with no wires or switches. They gently glow with a low light unlikely to wake up others who may be sleeping in the area, and they automatically shut off after 1 minute and reset to for the next motion activated turn on. Completely wireless,easy installation,wipe clean with a dry cloth. This outdoor LED solar light is solar-powered.After full-charged under sun it can keep working more than 10 hours. 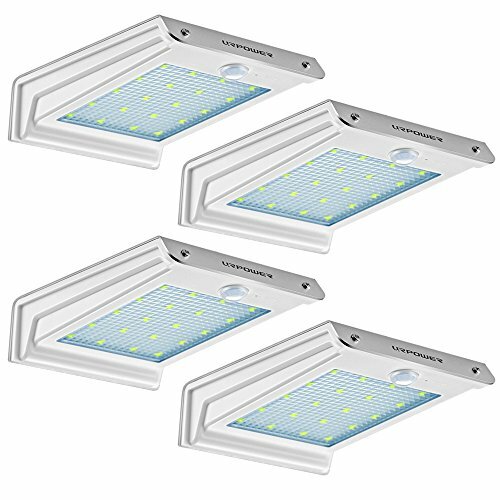 LED Motion Sensor Light with a large sensor – sensing range up to 10 feet with a 120 degree sensing angle.